The Sunway Education Group (SEG) took home 2 awards at this year’s Sin Chew Business Excellence Awards 2016. The Group received the Product and Service Excellence Award, and the CSR Excellence Award for the second year running. 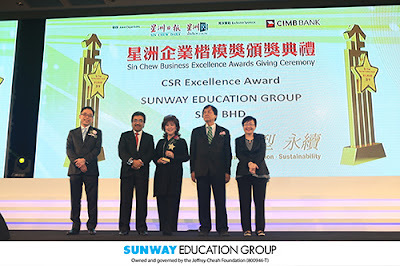 Dr Elizabeth Lee (centre), Senior Executive Director of Sunway Education Group and Sunway University received the CSR Excellence Award from Datuk Johari Abdul Ghani (second from left). The awards ceremony at Setia City Convention Centre on 11 November 2016, saw a total of 175 outstanding and exceptional winners. The ceremony was graced by the Second Finance Minister Datuk Johari Abdul Ghani. 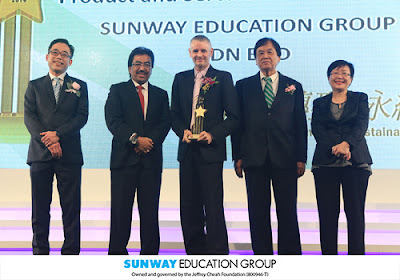 Patrick McVeigh (centre), Director of Branding and Corporate Communications, Sunway Education Group received the Product and Service Excellence Award. The Sin Chew Business Excellence Awards considered one of the most trusted and prestigious business Awards in Malaysia places emphasis on strategic management approaches. The awards serve as the highest accolade for organisations which have achieved excellence in all key business management disciplines, organisational growth and sustainability.